I’ve made both paints and inks, and I’ve been about equally successful at both – that is, somewhat so, with many successes, some partial successes, and many failures too. It’s something that takes practice, and knowledge of how binders react differently with different pigments, and there are often unexpected results and unforeseen problems. Overall it’s been incredibly fun, though it can certainly be exasperating at times too. A paint is a non-soluble, colored pigment powder dispersed in a binding medium, which forms the film that makes the pigment adhere to the ground (painting surface). Non-soluble, or insoluble, means that the pigment will not dissolve in the medium you’re using, but will remain in suspension, forming a paste. And a color can’t really be called a pigment unless it’s insoluble. Dispersing the pigment into the binder requires grinding. An ink, on the other hand, can either use an insoluble pigment as paints do – this is called a pigmented ink – or it can be an actual solution of color, which is basically a dye of some sort, heavily concentrated. So far I’ve been most interested in the latter sort, for a variety of reasons. 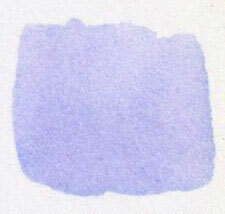 Sometimes some binder is added to the ink to thicken and bind it to the paper; other times the dye will stain the paper and adhere on its own. No grinding is necessary with a dye-based ink, because there’s no pigment paste involved. There are several different paint media that can be easily made from home if you’ve got the right ingredients: watercolor, gouache, egg tempera, glair, oils, casein. Which kind of paint you make depends on which binder is used. Oil paints require the pigment to be dispersed into a drying oil, that is, an oil that will oxidize and harden slowly in contact with the air. Not all oils are drying oils. Safflower oil, walnut oil, poppyseed oil and linseed oil are all examples of drying oils, and these are all popular in commercial artist’s paints. Egg tempera uses egg yolk as the main binder (this can also be mixed with more or less drying oil to make an emulsion, which is called tempera grassa, or fat tempera) and glair, one of the main binders used in period illuminations, uses the white of the egg instead. Casein is a medium of milk curds (I haven’t tried this one yet, nor have I painted with it). Watercolor and gouache use gum arabic as the binder. These last two media are the ones with which I have the most experience, along with the inks. 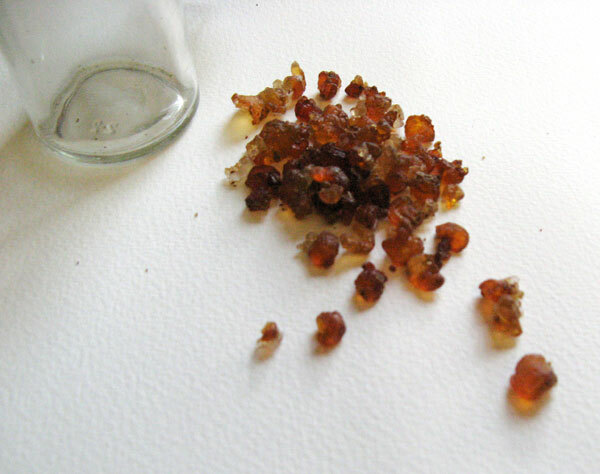 Gum arabic is a gum harvested from the acacia senegal tree, grown in semi-desertous regions of Sub-Saharan Africa. Other sorts of gum are out there as possible alternatives – gum from cherry or almond trees, gum tragacanth, and so on. Daniel V. Thompson, in his Techniques of Medieval Painting, notes that many kinds of gum were used under the name “gum arabic” in the Middle Ages; and Theophilus’s treatise On Divers Arts specifically recommends gum from the cherry or plum tree. I managed to collect a small amount of gum from a peach tree we had in our garden plot last year (the gums from cherry, peach, plum and almond trees are all supposed to be quite similar), and when I get a chance I’ll break it up and compare it with the commercial gum arabic I use. I also want to try adding gum tragacanth, which has properties I’ve read of that sound interesting, and which might help with some of the problems I’ve been having with watercolors. It’s about time to buy seeds for the garden for next year. I’m currently debating whether to try growing an acacia bush for my own gum arabic next year, in a large container. The climate here in southern California should be all right for it, but I don’t really have enough space – my seed list is growing long, but my garden plot is small! I’ll decide within the next couple of weeks. It’s an unfamiliar word: Sunsikell. Vaguely reminiscent of old books – kells – and new environmentalism – the sun. This is exactly the mix I was going for with this name: traditional skills and crafts, combined with a new (for civilization) regard for the health of our surroundings. Sunsikell. It’s not a made-up word, however; it’s actually an old name for one of the colors I make, a color that was popular in the Middle Ages. There is a plant, with three-lobed seed pods, which was used in those times to create three different clothlet colors for manuscript illumination. (A clothlet color is simply a dye that was soaked into a cloth and dried, which could then be used as an ink or wash color at any time, simply by rewetting a piece of the cloth with medium.) The name of the plant is turnsole. Though I did obtain the seeds and grow some plants eventually, this turnsole has mostly been a thorn in my side, providing me with much more difficulty than color so far. However, my continuing fascination with it (and perhaps in part the difficulty itself) has led it to become, for me, representative of my quest for natural colors. Once I decided to begin a blog journal of my studies and experiments – and perhaps eventually to provide some of my colors commercially – the unusual name “Sunsikell” seemed perfect for my unusual adventure. So there’s the name of the blog.